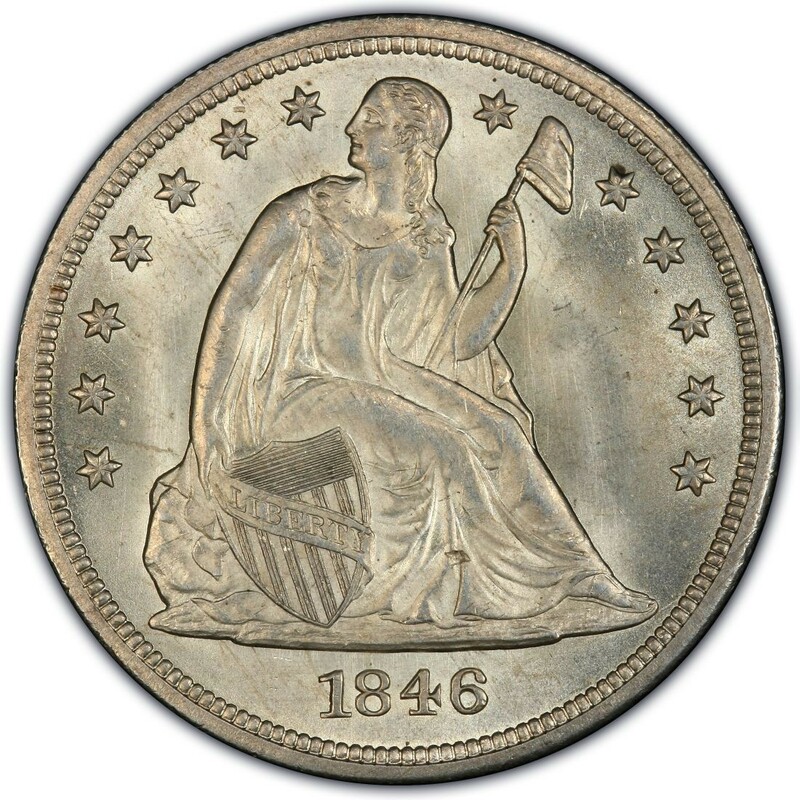 1846 Liberty Seated dollars are obsolete silver coins that are popular with coin collectors who enjoy assembling sets of 19th-century United States coinage. Seated Liberty silver dollars bear the same Liberty Seated obverse seen on most other silver U.S. denominations of the mid- through late-19th century. Liberty Seated silver dollars were designed by Christian Gobrecht, who served as the Chief Engraver of the United States Mint during that era. He also designed the other Liberty Seated silver coins, which were placed into circulation during the late 1830s. Liberty Seated silver dollars were struck from 1840 through 1873 and were produced at four of the then-operating mints, including those in Philadelphia, New Orleans, San Francisco, and Carson City. Liberty Seated silver dollars saw wide use throughout much of the 1840s and 1850s, but as silver bullion prices edged upward toward the end of that period, they became more commonly used in transactions involving foreign merchants. The similarly employed Trade silver dollar replaced the Liberty Seated dollar for this purpose beginning in 1873. *Price ranges are from a low grade of Very Good-8 through Mint State-60. Proofs were also made in small quantities and are worth about $30,000 and up. It should be noted here that only a tiny fraction of the above numbers of 1846 Seated Liberty dollars still exist, and most of those pieces are in poor or damaged condition. Wholly original Liberty Seated silver dollars are extraordinarily difficult to find. 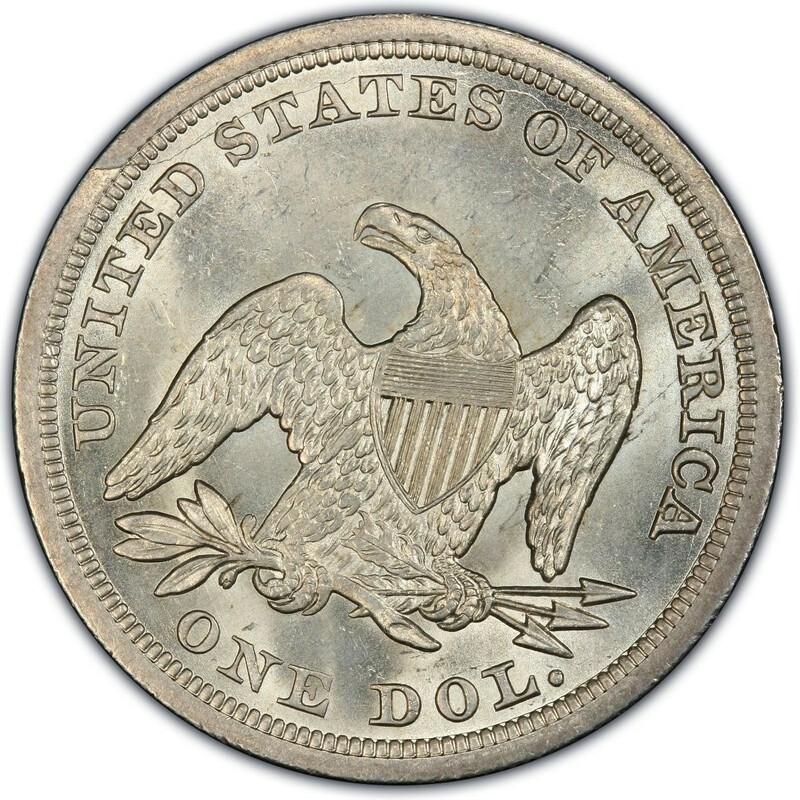 1846 Liberty Seated dollars contain a composition made of 90 percent silver and 10 percent copper, and each silver dollar has 0.77344 ounces, or almost one ounce, of pure silver. They also measure 38.1 millimeters in width and weigh 26.73 grams. This means that Liberty Seated dollars are the same size and weight as the more common Morgan and Peace silver dollars.